Northern Ireland, Belfast - present day. Raymond wants to die by the river, no hospital, no family and no one going into his house. He knows that there are things in there which he should destroy – but he can't. He locks the front door behind him and makes his way through the streets, his sick heart pounding and his breath short. At the pub on the towpath, one last drink, Black Bush. He savours it and leaves the pub as the cold sweat and the pain in his left arm strengthens. Not here. Further on, away from the people and buildings. Finally, with numbing fingers, he digs out his keys and throws them into the river before collapsing, falling towards the water's surface. 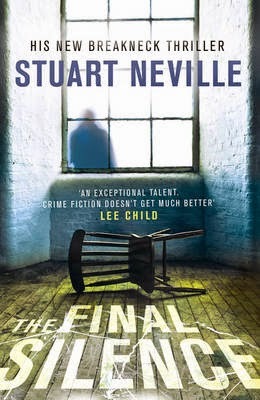 In THE FINAL SILENCE, Stuart Neville's fourth book in his DI Jack Lennon series, Jack himself is in a bad way. Suspended from the police force for shooting a fellow officer, still recovering from his own injuries, struggling to keep his young daughter out of the clutches of her dead mother's family – and with his old nemesis, DCI Hewitt of C3 Intelligence, still on his back. Rea Carlisle, an old girlfriend of Jack's, makes a macabre discovery in her dead uncle's house. Her politically ambitious father forbids her to go to the police, promising instead that he will deal with it, but Rea cannot rest easy. She calls in the only person she can think of to help her – Jack. Dragged into the mystery of the macabre find, Jack faces yet another police opponent in DI Serena Flanagan who seems determined to push him deeper onto the ropes. Stuart Neville is an excellent writer whose books (the earlier three in this series and RATLINES, a politico/intelligence thriller set in the world of 1960s Ireland) are exciting and absorbing. I have been waiting anxiously for the latest Jack Lennon. I am not disappointed. On his website's blog, Neville has written about his struggles with writer's block both before and early on in its writing, so I am relieved that STOLEN SOULS, the previous DI Lennon, was not Lennon's own "final silence". Neville has found a way through the block to give us another story that builds suspense and pace without sacrificing depth of character. Human stories intertwine with ambition, deceit and the darker regions of the psyche. Jack Lennon is already more physically battered and scarred than Ian Rankin's "Rebus" but he too continues to slide down the greasy pole of his police career, notching up enemies with each lurching descent. Bad history and bad company contribute to his beleaguered state. Yet something within Lennon still urges him to play the “knight chivalrous” down streets filled with the bitter legacy of Northern Ireland's political struggles and factions. I am trusting that he will remain a force to be reckoned with – and I'm glad that both he and Neville are back. This series sounds right up my alley! I am adding it to my list as we speak.